This is part two of a series, if you haven't read part one yet I'd encourage you to. Link to part one. Before I begin this post I want to address a few comments readers made on my last post. The point of these posts looking back on net-nets isn't to create an academic record that investing in net-net stocks outperform the market. I don't have the analytical tools, or the desire to undertake that. As most readers probably know this blog and investing are a hobby for me. I have a job, a wife, two sons (youngest just born Sunday!!) and when I find free time late at night I like to research stocks. Given my limited time availability I'd prefer to research new ideas rather than conduct a full academic study on net-net investing. If anyone is interested in academic studies there is the Tweedy Browne article, the Henry Oppenheimer research. Those two pieces look at investing in net-nets from 1970 to 1984 with full statistical rigor. They also show the strategy has outperformed. Unfortunately those studies end in1984, but fortunately a paper came out recently that fills in the gap. Floris Oliemans studied the performance of Graham's NCAV strategy from 1984 to 2008. His paper is here, I'd highly recommend everyone read it if they get the chance. There's also the study that Ben Graham conducted himself from the 1930s to the 1970s where he said investing at 2/3 NCAV and selling at 1x NCAV returned 20% annually. So what is the purpose of these posts? There are really a few purposes, I wanted to look and see how investors would do if they bought net-nets and subsequently forgot about them. 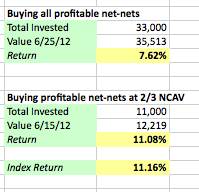 In my last post I wanted to see how investing in net-nets would do in a market bottom. This post I am going to show how they did purchasing right before the market drop, and then after the rise from the bottom. The next post in this series will be a summary wrapping things up and giving my overall thoughts on this process. The criteria for both of these runs were companies that had one straight year of profit, in June of 2008 there were 39 companies that matched this criteria. If an investor went out and spend $39,000 buying $1,000 of each and then subsequently forgot about those stocks until 6/15/2012 they would have $50,069. A few went bankrupt, a few went nowhere, some went up a bit and one went up 10x. 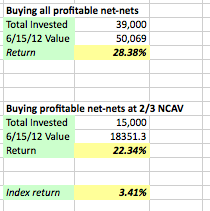 Based on some recommendations from my last post I also highlighted the stocks trading at 2/3 NCAV and did a separate performance analysis on those. Two years isn't all that long and many names on that list are current net-nets such as OPT Sciences, Coast Distribution, Solitron, TSR and others. Some readers will probably look at the lists above and actually examine the data, most probably only care about the performance blurbs below. I can understand that although close examination of the data provides some interesting insights into this strategy, I'll cover that in the third part of this series. The index return is the Vanguard Small Cap Index ETF with the ticker VBR. Disclosure: I own some of the companies that appear in the screens. Congrats on your new son! Great post as usual. I would like to ask you about your affirmation that "concentrating in the best net nets is silly". 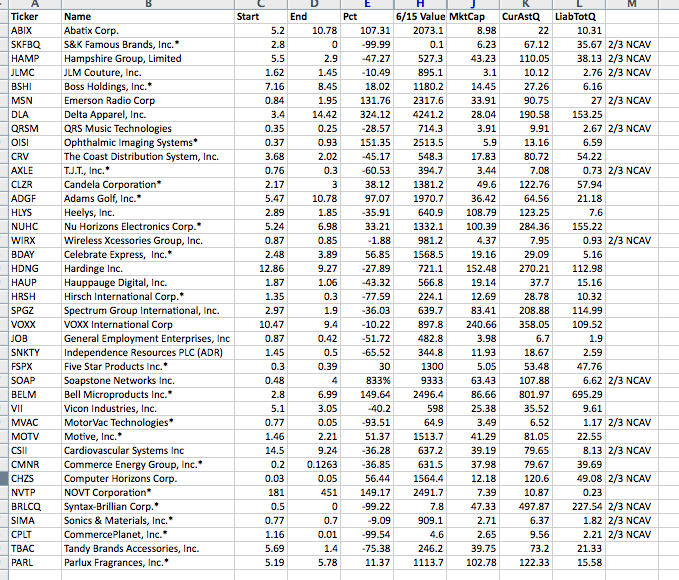 While i tend to agree with that for obvious reasons i think there can be some "special" cases when you can see a stock in a different way, i mean not through the rigid lens of net nets stocks (despite the stock trading below NCAV). 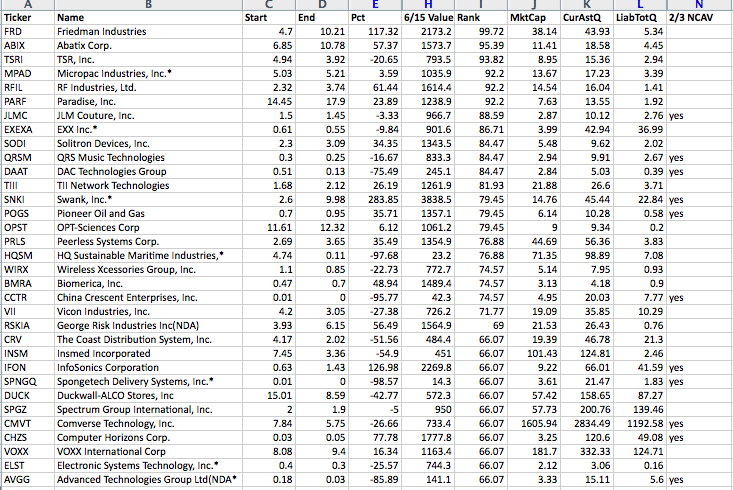 You can see them as good businesses (above average). Of course they are very rare. Thanks in advance for your thoughts on this situation. I agree, there are actually a few decent companies buried in the rubble, and those should be looked at differently. Congrats on the birth of your son, Nate ! We appreciate your thoughts and effort on this blog. BTW, it's curious that the deeply discounted net nets performed worse than a basket of all net nets from the 2008 table. Could it be because of 1-2 outliers in that sample which as a % was higher in the 2/3 ncav group and which brought down the IRR of the group ? You're right that the outliers really cause a distortion. 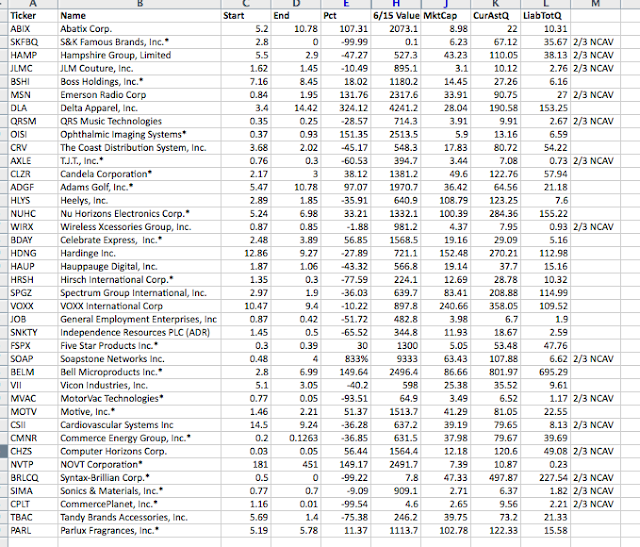 Just missing a few of the biggest losers bumps performance up almost 20%. Thanks for the links to those three studies--I appreciate it. And congrats to you and your wife on the birth of your son!